LIBERAL, Kan. – The Kansas Jayhawk Community College Conference announced their All-Conference teams on Thursday and two Saints were named to their teams. 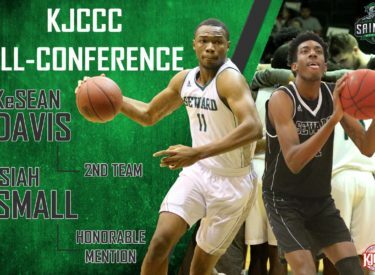 Sophomore Ke’Sean Davis earned 2nd Team All-Conference, while freshman Isiah Small was selected to the Honorable Mention All-Conference team. Davis was second on the team in scoring with 13.4 points per game. He played a major role for the Saints, hitting crucial shots throughout the season. He ended the year shooting 49.7 percent from the floor and 41.0 percent from behind the arc. On top of his points per game, he came away with 6.3 rebounds. Davis played in 30 games, starting in 27. Small, the New Jersey native, led the Saints with 14.8 points per game, good for ninth in the conference. Small led the conference in field goal percentage, hitting just shy of 60 percent of his shots (59.2%). Small added 6.9 rebounds per game and nearly a block per game (0.9), serving as the Saints rim protector. Small played in every game this season, but had to earn his starting role, starting in 23 games.